Trying to make Heroic’s work with Combatridps. Making a lot of Tokens and either using them for Value with things like Path to Exile . All of my removal is tutorable with Sunforger , and the majority of it can also be aimed at my own creatures for Value (i.e. Oblation ). Main ways to win are to stall the board out and protect my Token producers with cards like Veilstone Amulet and Intimidation Bolt ; while assembling a plethora of Tokens and swinging wide under an Iroas, God if Victory; or big alongside Zada, Hedron Grinder . Running a basic Sunforger support line with Tithe , Magnetic Theft , Mistveil Plains , and Sun Titan . I need to tutor up Theft to discount the hammer; then from there I can either grap a Combatrip or spot removal to grind out the match. Loving my new mana package; being Braid of Fire , Chrome Mox , Runaway Steam-Kin , Lotus Petal , Simian Spirit Guide , and Jeweled Amulet : as these cards allow me to either dump my hand each turn ar will or drop Feather on turn 2. Re-added my original Sunforger support in Sun Titan and Mistveil Plains . Opted out of good cards like Fell the Mighty and Vandalblast in favor of better removal such as Orim's Thunder and Oblation ; PLUS they are repeatable for more value; AND tutorable with Sunforger. Tossed in a Tithe in place of an outdated mana rock. 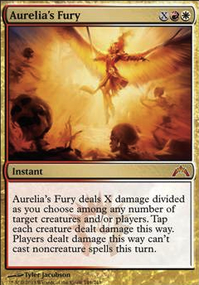 If Boros had some white rituals; I’d be thrilled to have this play out like a Grenzo styled deck. Changed my basics to reflect my new mana requirements.